You are here: Home » From the Atlantic to the Moon. It was 42 years between man crossing the Atlantic in a plane to man walking on the Moon. Today, that’s about half a lifetime ago. Someone who was born when the first event happened could have been inspirational into getting the second one completed. 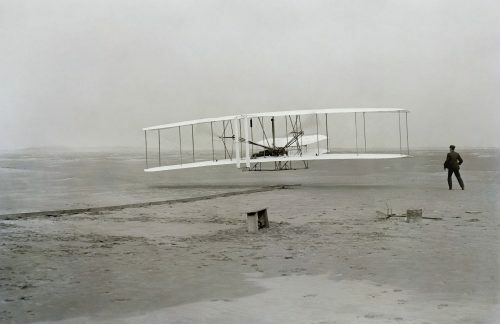 If we go back 24 years from the first event mentioned above then we have the Wright Brothers flying 37 meters [121 feet]. Jumping forward 66 years from that first heavier than air flight, we have Armstong and Aldrin walking on the moon. It was this cartoon that got me thinking about timescales. Click on the link to get the full story. It’s only a link so not to spoil both the punchline and the rest of this post.